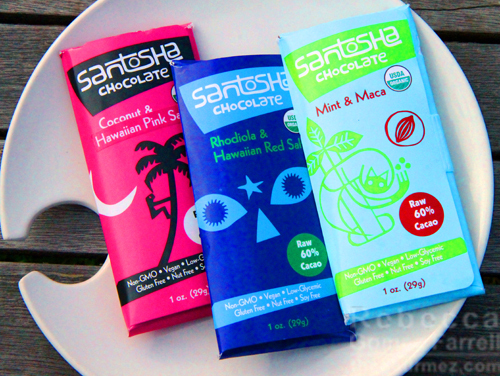 Santosha Chocolate is raw, fair-trade, humanity-committed chocolate made in Asheville, NC. I met, or re-met, rather, founder Don Rowe at the Santa Cruz, CA, home of one of my best friends. Her husband happens to be Don’s step-brother, and I happened to be down for a visit the same time he was this past December. What’s more? We were both at the rehearsal dinner and my friend’s wedding and completely didn’t remember meeting each other. Don broke out some of his chocolates, and I hinted at my food and drink blog, and lo and behold! I had three beautiful bars to review. Obligatory disclaimer: That means this chocolate was all free to me! Yippee! Convoluted enough of an intro for you? Well, this chocolate aims to be anything but. The raw cacao taste is so well-preserved that it pops with fruity intensity, to the point that half a square seems like plenty. But you know that craving you get from hot sauce? The one Sriracha has managed to bottle? It roars to life a minute or so after you’re done, and then you really want another hit. THIS IS DANGEROUS. Why such a potent impression? 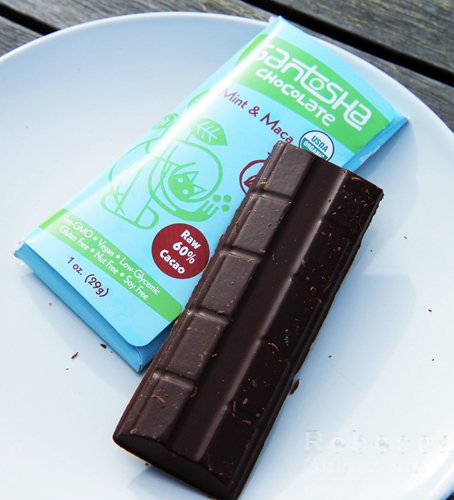 As mentioned, Santosha Chocolate uses raw cacao bean — there is no roasting here. According to their website, the process used preserves “the living enzymes and other micronutrients of one of nature’s most powerful, nutritious, and rejuvenating foods.” All beans are acquired through fair trade, and they are sweetened with coconut palm sugar, making them safe for most diabetics. Even the packaging is recycled and the ink comes from vegetables; every step of the production process matters to these folks. I love how informative the cases are for the bars, with a full production history and information about the potential benefits of the ingredients. For instance, I learned that maca, a plant from the Andes Mountains, can boost libido and endurance as well as boost my Vitamin B, C, and E levels. Overall, the chocolate is grainier than some people might like, but I found it made for a unique textural experience — especially for the mint maca bar, which I rolled over my tongue continuously while exploring it. Think finely ground spice that hasn’t been fully incorporated into a sauce — that’s the texture that runs through the cocoa base. The mint element was subtle, not pungent — a garden-fresh herb wisely used sparingly. I appreciated the extra texture the coconut provided, though I wondered if I’d appreciate it more laced into the chocolate rather than pressed into the bottom. I’m overthinking it, though — it’s good chocolate! 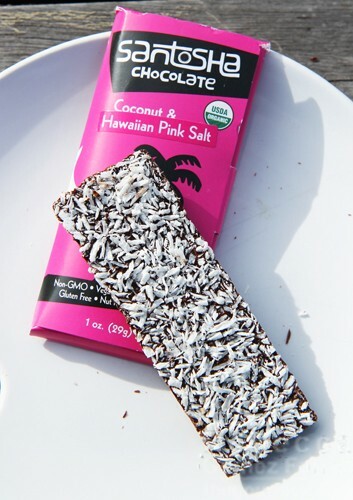 The pink salt combined well with the chocolate’s fruity expression; think stewed cranberries for this 70% cacao bar. 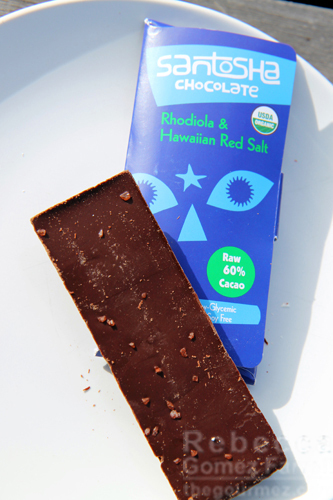 The rhodiola and Hawaiian red salt bar benefited from the rhodiola’s subtle herbal quality that nicely complimented the chocolate’s bright fruit. I loved the somewhat smoky red salt, but I’d have liked more of it in the bar — I don’t say that often in regards to salt. Of the three, the mint maca was my favorite for overall blend of flavors. Really, though, the chocolate is so bold in each of these bars that they’re all treats worth repeating. It’s $4 per 1 ounce bar, which is the size pictured. Is that expensive? Yes, but I think it’s worth it for such a high-quality and thoughtfully made product. You can choose from their eight options at their online shop or at over 200 retail locations. They also sell a coconut-chocolate crème in jars! Yum! YUM! The doctor has put me on restrictive diet because of some health issues (low FODMAP), which has made finding “treats” more difficult. However, after a quick look at the ingredient list of several of the bars, and I think most of them are low-FODMAP friendly. YAY!! Get on it, girl! Got to celebrate the treats your body will let you eat!